I wasn’t going to think twice about you. I was going to simply never buy a Toro lawn mower again and forget about this whole episode. But then you asked me directly for my opinion via your Toro email survey. You even said “We’d Love to Hear What You Think!” . Awesome, I’d love to tell you! You see, I also care about product. I’m obsessed with user experience – that’s why I work as an interaction designer. I love getting real user feedback on my software. So, I thought you’d like some honest and accurate feedback on your product. I filled out your survey and patted myself on the back for doing my good deed. My review absolutely followed your guidelines! No obscenities were used, no contact info, no advertising, but oh, what’s this? I can’t be critical of the Toro product I bought? 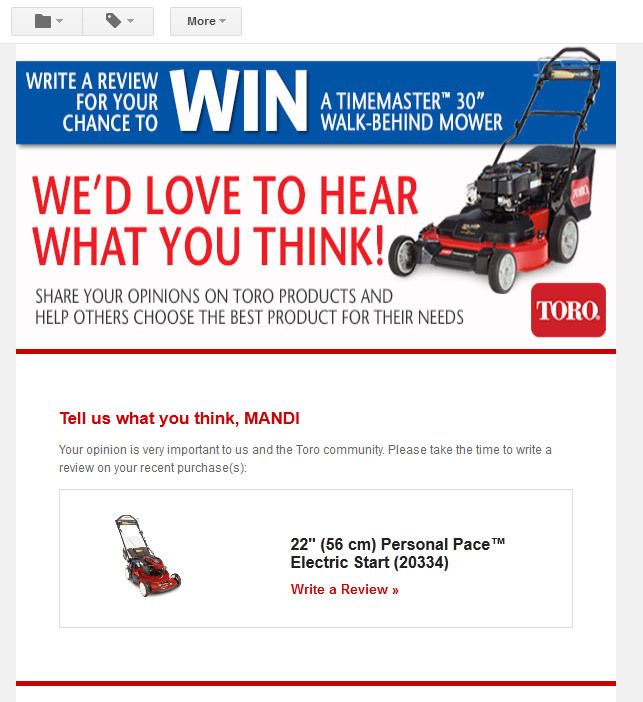 Toro doesn’t want to hear negative feedback about their lawn mowers. 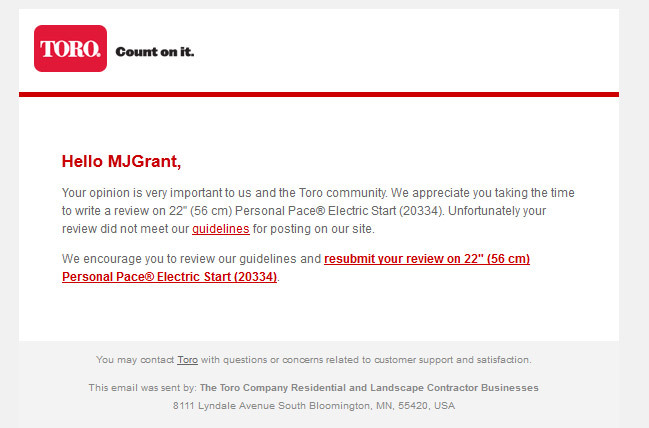 Clearly, Toro does not care about product feedback and does not want potential customers to know about flaws in their lawn mower products. But that’s okay, I can post my review here, where it is the single largest driver of traffic to this blog. 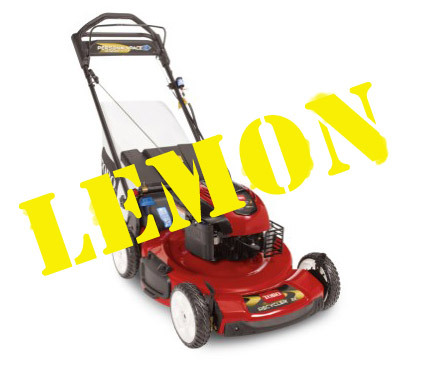 My Toro Personal Pace Electric Start 20334 is a lemon. My Toro lawnmower, model 20344 with Personal Pace and Electric Start, purchased April 2010 from Home Depot in Bothell WA, has had a very short and disabled life. At the time of its last use, it was 18 months old. My lawn is modestly sized and quick to mow. It has mowed my lawn less than 20 times. – Toro doesn’t do house calls, so I had to disassemble this and stuff it into my sedan to get it to a repair shop. The cause was determined to be a problem with Personal Pace… but not a problem relating to the recall. AHAHA that’s how they getcha, we paid full price for that repair. $80 and 5 weeks later, we had our mower back. Hooray? – Electric start just stopped working. The only way to start this mower now is to yank the cord repeatedly, which I can do… but that’s like asking: if you can push your car, why drive it? Why pay more for a feature that doesn’t work? Am I alone in thinking this mower is junk? Amazon reviewers have rated it 2 stars out of 5. This blogger has had as much trouble with their Toro mower as I have with mine, if not more. Plenty of bad reviews over on Home Depot, too. So why did I get suckered into owning this mower? I didn’t, my Dad did. He bought it for me as a gift, without researching it, out of trust in Home Depot and the Toro brand. I had the same issue with mine. One season then the GTS (Guaranteed to Start) feature meant Guaranteed to STALL. The TORO dealer said this was my fault due to old gas and not covered under warranty. I noticed the ENTIRE repair center was full of the same mowers. They are making a killing on this POS machine. DO NOT BUY A TORO, RUN AWAY!!!! I hate personal pace mowers. My old mower had one pace, fast, I could hardly keep up with it. These things with their adjustable pace just doesn’t move very;. I think it is thebelt that just does not move the back wheel fast enough. They just don’t move when in the grass. I’ve got the Timemaster 30″ with personal pace. The personal pace transmission quit after about 3 hours of use and I have a flat lawn. I live over an hour from my Toro dealer so I used it without the personal pace until the idler pulleys started making a loud noise. They didn’t have dust covers on them and the bearings are not sealed. Unfilled screw holes in the deck encourage dust to get in the bearings and destroy them. I finally took it in and they are replacing the transmission and the idler pulleys. The new pulleys have dust covers. I wonder if the transmission will be better this time??? My Toro Mower says “Guaranteed to Start”. Such a crock, have had problems starting it from the first 3 months I owned it. Will NEVER buy another Toro crap product again!!!! My mower hasn’t consistently started since the fourth month I purchased it. I have sent it, through Home Depot, to be repaired and have broken the carburetor down twice myself to get it to start. It will run for a few weeks and the problem will come back. I will not buy another Toro! I have a Toro POS also, I hate it. Never will I buy another one. I can’t understand why Toro doesn’t go belly up selling the crap that they do. I purchased new, Toro Guaranteed Start lawn mower from Home Depot. Guaranteed Start feature is anything but a guarantee. Mower is not a guaranteed start what so ever. The consumer is misled and left out in the cold if the mower will not start as guaranteed! This particular mower has been in the shop 2 times for a total of $100.00 in repairs while still under “factory warranty”. The owner’s manual is followed as directed. However, the repairs are not covered, how??? Begging Toro to take mower back for refund or exchange and they will not. Stuck with a faulty Toro machine, out $350.00, no support from customer service, poor communication from authorized Toro dealer, mislead advertisement of “Guarantee Start” and an overall horrible Toro experience. No problems starting but the pulley… I have replaced it 2 times… even with the new one having a dust cover… it still failed I have owned this 2.5 years and use it once a week. THANK YOU!!! Very glad I stumbled upon your review. I was tempted to purchase the Toro 20334. Been researching for about 3-6 months. I have the Toro 20076 purchased May 2007 Same features, but with a Briggs and Stratton engine.. I was “assuming” the problem was the Tecumseh engine. Problems identical to your new one and then some. I work on it myself…because NOTHING was covered, even with extended warrantee. Mine now runs about 20-30 minutes, then stops. Starter’s been inop for about two years. On the model you have, I do not like where the battery, many folks have had issues with grass being forced into it damaging battery and wires. Hope you have found a better working, more reliable mower.